Water fed poles consist of several sections of tubing telescoped one inside the other. Each length has a clamping device enabling each section to be adjusted independently giving variations in the height. A specially manufactured hose runs up inside the pole. 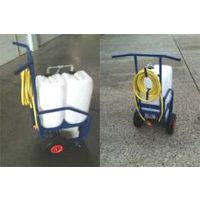 There is a choice of single or dual hose. With the latter the hose separates inside the top section. 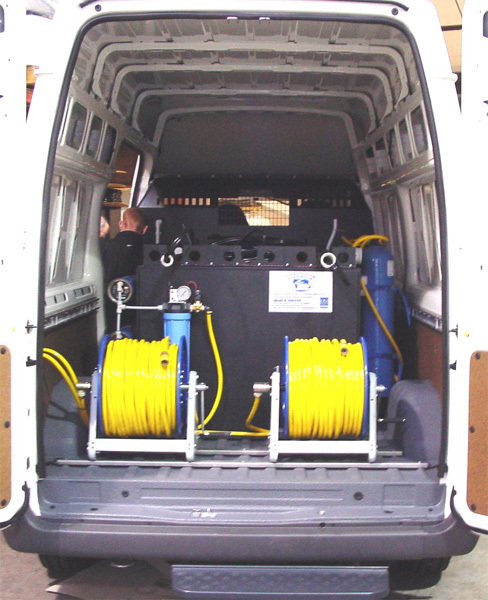 A dual hose system has unique detergent and chemical cleaning accessories enabling fluid mixes to be fed, under water pressure, to the brush via an interchangeable “gooseneck”. 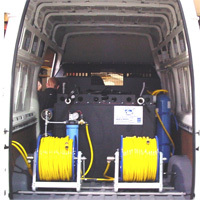 The second hose feeds an overhead spray. This produces a fan of rinse water over the brush. 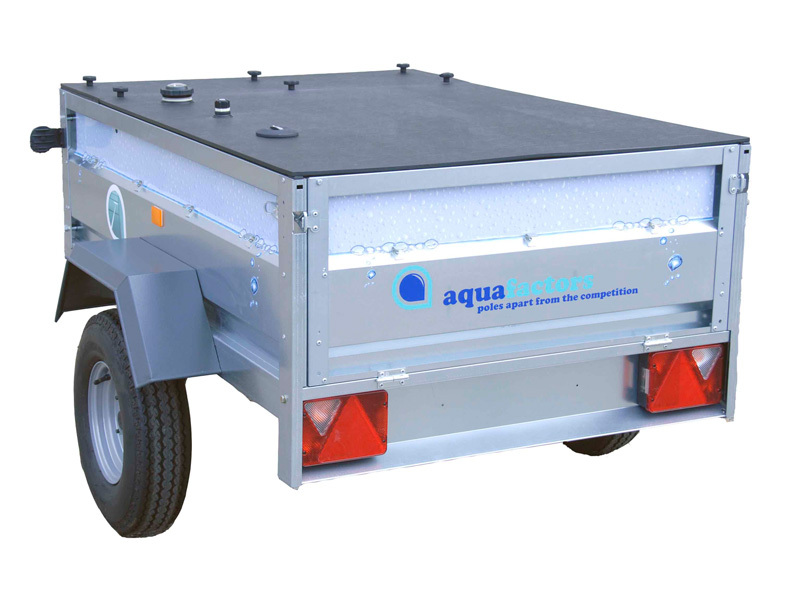 Water fed pole systems can simply be operated with normal tap water pressures. 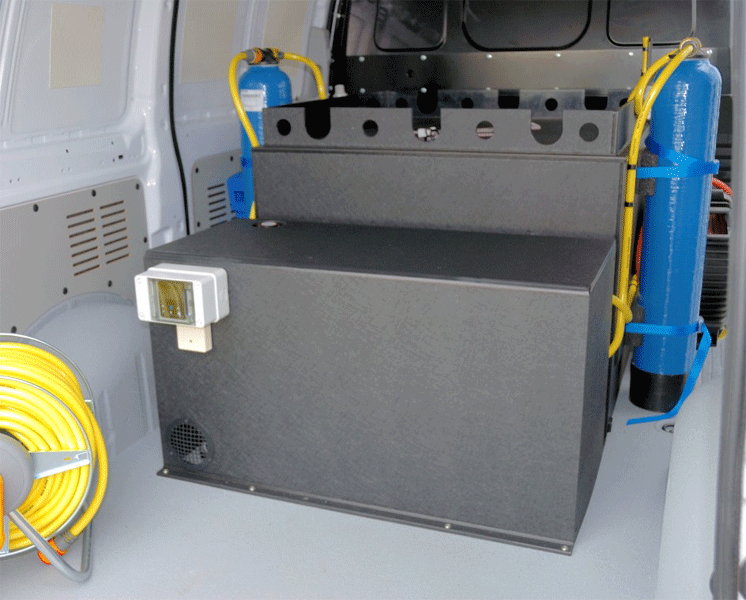 However, there are several options including mobile tank systems with or without an independent static water making facility. 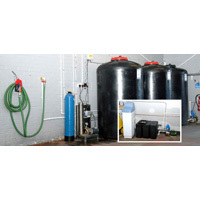 Choice of equipment much depends on individual requirements and the water treatment employed. Poles up to 14 metres (45′) can be operated by one person. A second assistant can be helpful on the bigger poles and if there are obstructions. The base of the handle section should be placed against the foot of the building, on the ground, at a right angle. The pole should be picked up, near to the brush, and raised over the operators head with both hands. It is then a case of walking towards the building raising the pole hand over hand. This is not dissimilar to raising an aluminium ladder up against the side of a building. As the pole is raised vertically one hand should grab the handle section and the pole lifted away from the base of the building. 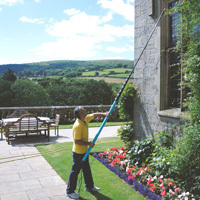 While keeping the pole perpendicular to the wall, the brush end can be gently placed against the surface to be cleaned. The base of the pole can then be placed on the ground, at a slight angle, letting the bend of the pole slowly transfer a portion of the unit’s weight onto the brush and against the surface to be washed. Lowering the pole can be done while in the vertical position by slackening off the section above ones head and slowly lowering it into the section below. As carbon fibre poles are lighter and many are longer than aluminium poles they have to be handled differently. Certainly, poles over 10 metres (35’) must be raised while the pole is in a vertical position, one section at a time, while resting the brush on the fascia of the building. 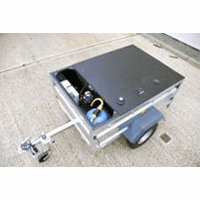 They can be lowered in a similar manner as described with aluminium poles. As has already been stated the pole assembly is very light related to its size. Once positioned against the surface to be cleaned, an up and down movement of the pole is actioned by a body rocking movement and by walking backwards and forwards rather than by moving the arms up and down. All top windows should be cleaned first before the pole is shortened to the next row of windows. It is simple to lower the pole while raised. As most poles use 1.8 metre (6’) sections or less it is easy to slacken each individual section and lower the pole to the required length. Judging pole heights comes with a few weeks experience in using the poles. An operating manual is supplied with every system. All the brushes are interchangeable and specially manufactured in a special grade DuPont® nylon. They are available in double trim, full trim and with a foam centre. The nylon bristle has four different strengths for various uses from Plexiglas to cleaning concrete walls. 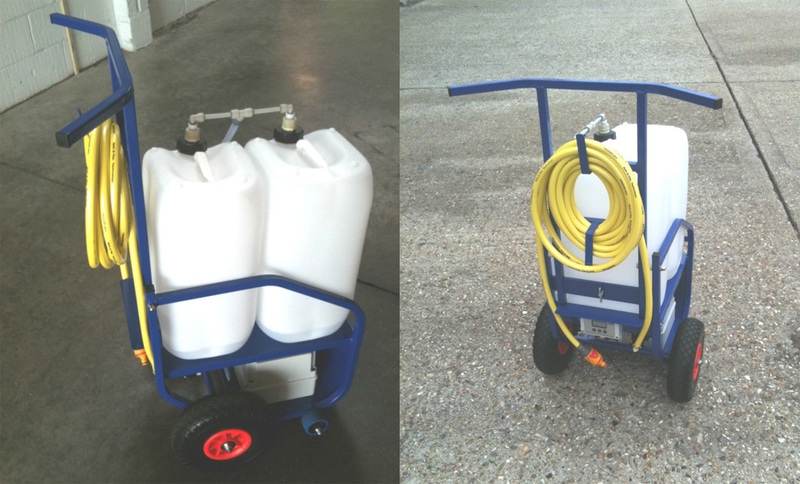 They can also be customised for your cleaning needs. The double trim brushes are most effective for windows with horizontal and vertical bars. The foam centre brushes are specifically designed to retain water, on the glass, in hot weather. They also give a good scrubbing action.